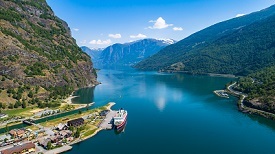 Flam is situated in the innermost part of the Sognefjord, surrounded by high mountains, in the heart of Fjord Norway. The whole of this scenic town is within easy walking distance of the port. You’ll find handmade knitwear and attractive wood carvings in the local shops. For snacks and drinks, there is a café with outdoor seating near the pier, and the popular Fretheim Hotel serves breakfast, lunch and dinner.